A West Atlanta Entrepreneur Runs A Shared Kitchen For Local Cooks As part of NPR's Kitchen Table Conversations, we revisit an entrepreneur in West Atlanta who wants to preserve the culinary traditions of a neighborhood even as it gentrifies and changes. 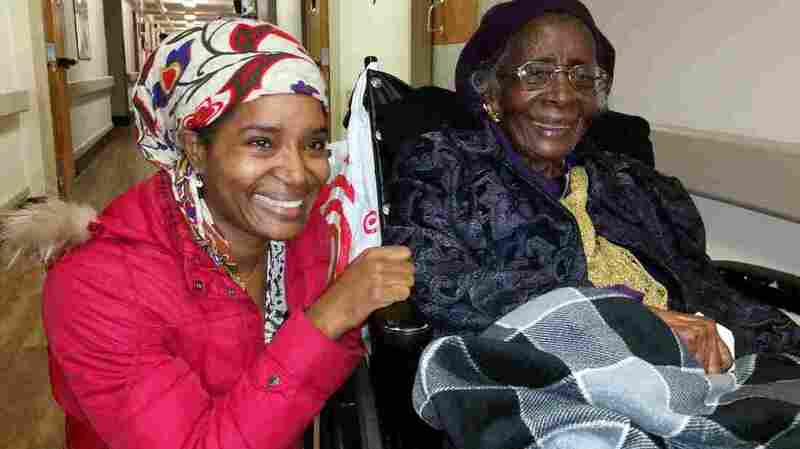 Keitra Bates (left) moved to tears upon meeting 106-year old Leila Williams at her nursing home. Bates recently discovered that Williams once ran Leila's Dinette in the building where Bates now runs Marddy's Shared Kitchen and Marketplace. We examined how people from all walks of life are faring under the new administration. Voters talked about their finances, health coverage concerns, and Trump's promises to revive U.S. industry. In early 2017, Keitra Bates was concerned about the future. She'd recently closed her business — a pizzeria — when her landlord raised the rent. She decided that whatever uncertainty the new administration presented, she needed to focus on chasing her dream and improving opportunities in community, not waiting on government action to make things better. Now, that once run-down building has a fresh coat of coral paint outside, and cozy, warm décor inside. "So welcome to Marrdy's," Bates says as she opens the wrought-iron door with the keys that belong to her thanks to seed money from a local innovation grant. 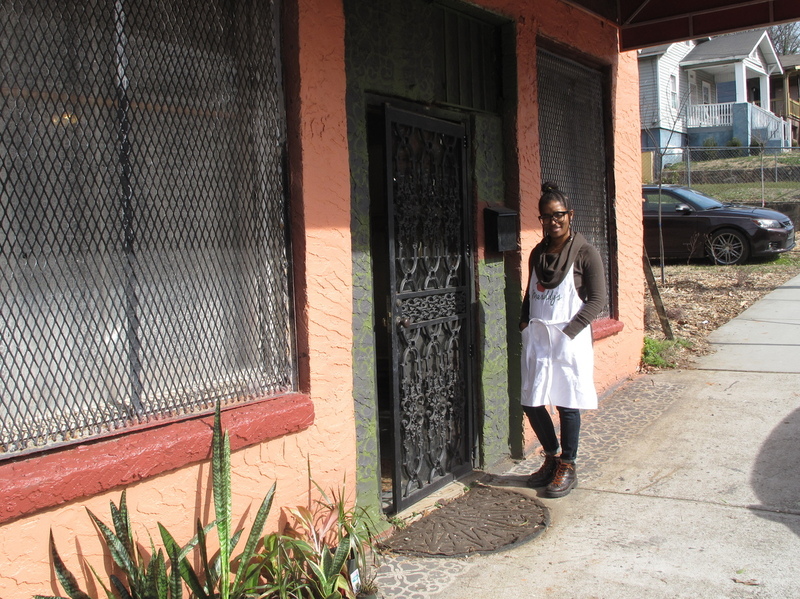 Keitra Bates outside of the newly renovated Marrdy's Shared Kitchen and Marketplace. Marrdy's — a shortened form of Market Buddies — is a shared kitchen where home cooks can make and sell their products. Bates calls them "hidden entrepreneurs." People like Raisha Williams, aka "the Cookie Lady." "I typically go around to barbershops in the neighborhood and sell cookies," says Williams, a mother to two sets of twins, ages 16 and 12. She started the business ten years ago when she couldn't find a job. "I had to think about the quickest way to make some money," Williams says. "Cooking or baking has always been the quickest way for me to generate income." These people have created a business with their talent and they have a right to survive. Williams hopes having a commercial kitchen available will help her business grow. 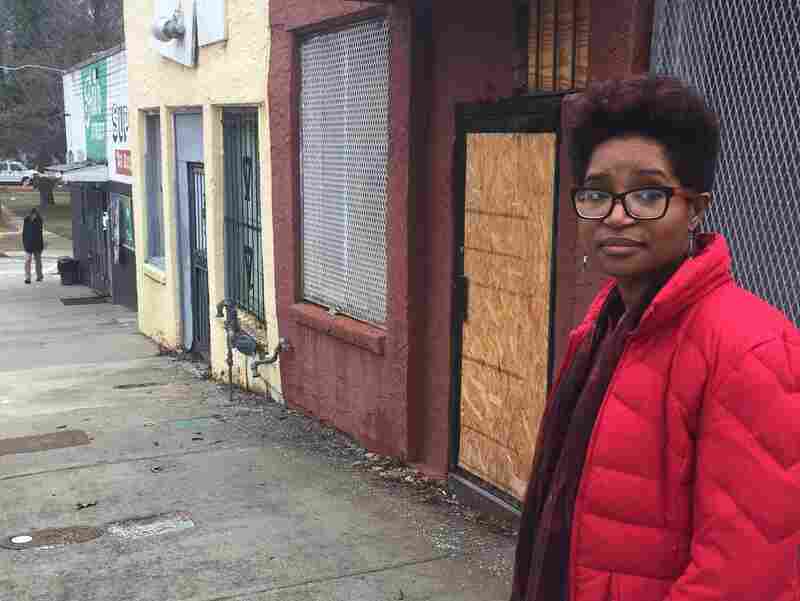 Bates says that's part of Marddy's mission, but she says it's also about preserving the culinary traditions of a neighborhood even as it gentrifies and changes. "It's way bigger than just cookies," says Bates. "This is part of our community and how we support each other." This part of West Atlanta is seeing new development. Bates says with rents on the rise, African-American home cooks have fewer local black businesses where they can sell their goods. She says a whole economy is in danger of being "ghosted." "These people have created a business with their talent and they have a right to survive," says Bates. "Just because you know there's new money coming in doesn't mean that their business should get snuffed out." Bates, who is 45, is a caterer. She and her husband Kevin, a graphic artist and music producer, have five kids, ages 3 to 14. She wants them to learn the value of entrepreneurship. Her vendors include a woman who makes salad dressing, a community gardener, an elderly couple who sell sweet potato pies, and a group called Gangstas to Growers that teaches formerly incarcerated youth to grow peppers and make and sell hot sauce. Marddy's has cooking and prep areas in the back, and a long lunch counter with a retail space up front. Bates is using the original counter from when the space housed a diner called Leila's Dinette from the late 1940s into the 80s. Bates offers crockpot cooking classes to students and others in the neighborhood who don't have full kitchens. She says the idea is to help them eat healthy. "You know in Atlanta, in 1949, there weren't a whole bunch of restaurants where we could go and eat," Bates says. "We definitely want to pay homage to our ancestors and keep something that was original to the space." The building had been boarded up for decades until Bates bought it. She recently discovered that the original proprietor — Leila Williams, age 106 — is still living. Bates went to meet her at an Atlanta nursing home and now makes regular visits with the help of Williams' goddaughter Charlotte Riley-Webb, a local artist. Williams chuckles when Riley-Webb tells her that Keitra and her husband Kevin have come for lunch. On this visit she's not too talkative, but recalls making fish sandwiches and greens at the diner. "All kind of vegetables," Williams says. "Oh it's been a long time.....Leila's Dinette." 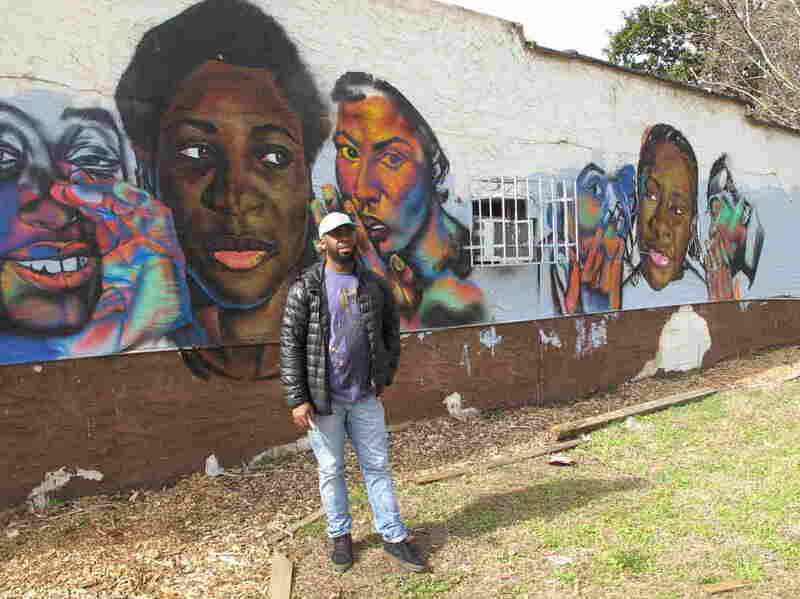 Atlanta artist Fabian Williams is painting a mural on the side of Marddy's. He says it's about younger generations listening to their ancestors. Riley-Webb says customers included students from the historically black colleges just up the street, and civil rights leaders were known to have strategy sessions at Leila's Dinette. Williams remembers serving the Rev. Martin Luther King, Jr. Riley-Webb says President Jimmy Carter also ate there. "It was a small little place but a lot took place in that little place," says Riley-Webb. On her birthday last year, Leila Williams was honored with a city proclamation. Riley-Webb says it took uncommon strength for a woman to start a business back in the 1940s. "To have the tenacity to do something like that in that day with virtually, actually nothing," she says. Keitra Bates says it was an audacious act at the time, and has found inspiration getting to know Leila Williams and learning about her dinette's place in Atlanta history. She says it gives her "a glimpse of what I feel like I'm evolving into." But Riley-Webb says the outlook is different today. "Ms. Leila's outlook on life was survival," says Riley-Webb. "Yours is accomplishment. Yours is 'okay, we can be our full selves and we can work together.' That's what I like about the idea of Marddy's." Bates would like to see Marddy's be the same kind of community hub that Leila's Dinette was. She has held crock-pot cooking classes for the neighborhood, and the refurbished storefront is generating curiosity as passersby stop to check it out. Being African-American, our survival has really depended on us being wise in terms of how to maneuver around white people and their feelings. Even as her new venture is finding early success, she says speaking up about the impact of gentrification has been a source of anxiety. "I had to really deal with my fear," Bates says. "Being African-American, our survival has really depended on us being wise in terms of how to maneuver around white people and their feelings. So if a white person gets angry there's often some kind of price to pay if you're connected to their displeasure." Bates says she tries to keep her focus local, and not get caught up in the endless drama of national politics. But the Georgia governor's election last year felt like a setback she says. Democrat Stacey Abrams, an African-American woman, lost in a close and hard fought race against Republican Brian Kemp in a contest marred by allegations of voter suppression. "The hope of someone like Stacey Abrams and the fact that you know I feel like she did not receive a fair run, it makes this work more important to me," says Bates. "Because it says, 'hey we can't really count on things according to the powers that be to be fair.'" Bates says American institutions have long failed black citizens. That echoes her sentiment when I first spoke with her just after President Trump took office. At the time Bates said she heard a lot of angst about his election, but thought that energy would be better served if people would invest in making their communities stronger. Now, Bates says Trump's presidency has pulled the curtain back and sparked a dialogue about race. "Hopefully people are talking more," Bates says. "Are they afraid of otherness?" Atlanta is known as the "Black Mecca" — a city that draws African-Americans because of the opportunities here in politics, philanthropy, and business. But even as the city was hosting the Super Bowl last month, there were conversations about who was benefiting. Were so-called "legacy residents" being left out? One of Bates' vendors was able to get a Super Bowl catering contract with access to Marddy's commercial kitchen. Alicia Gibbons used the prep area to layer cake, strawberries, cream cheese filling, and glaze into tiny plastic cups to make 1,500 strawberry cheesecake shooters for a Super Bowl-related function. "I never thought that my food would be in the Super Bowl," says Gibbons, who has company called Fruity Ice and Sweet Treats. 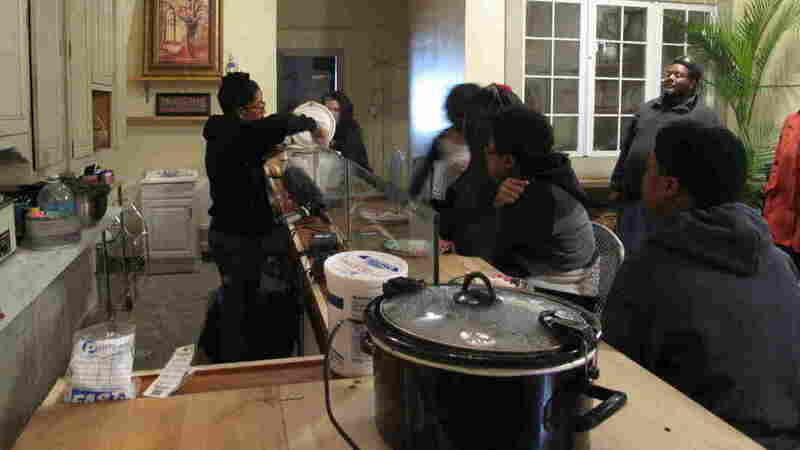 She was able to get licensed, inspected and insured for food sales being affiliated with Marddy's shared kitchen. I want to see prideful expressions all around this neighborhood. I want us to hold our culture in the kind of reverence that it deserves. Another vendor, Haylene Green, runs the West End Community Garden. She hopes access to the shared kitchen can help her sell traditional Jamaican teas and soups and other goods on the wholesale market. "We can do our cooking, our preserving, our baking and sell to places like whole foods or any other third party," says Green, who calls herself the "Garden Queen." "We are just as good as Coca-cola just not as big. Striving to be there." For Keitra Bates, the payoff is in seeing new opportunity for these local chefs. "I want to see prideful expressions all around this neighborhood," says Bates. "I want us to hold our culture in the kind of reverence that it deserves."